Dr. Dover received degree in Chemistry. He completed dental school at Howard University College of Dentistry in Washington, D.C., and went on to complete a post doctoral residency in Advanced General Dentistry at Howard University. 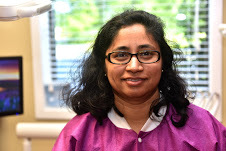 Committed to remaining on the cutting edge of dentistry, Dr. Dover continually completes advanced education courses in a variety of cosmetic dental procedures. He is a member of the Academy of General Dentistry, American Dental Association, and the Delaware Dental Society. Service to the community and family plays a significant role in Dr. Dover's life. A proud military veteran, Dr. Dover served 12 years in the United States Army. He is married and is the proud father of a beautiful daughter, and a wonderful son. His interests include art, photography, reading, and love spending time with his wife and kids. His life philosophy is "Live life to leave this world a little better than you entered it." He is committed to demonstrating this philosphy at Townssend Family and Cosmetic Dentistry.